On my way home after church a few weeks ago, I stopped for a snack at the Arizmendi Bakery on Valencia Street in San Francisco. Behind the counter is a small chalkboard that usually displays a handwritten inspirational message, usually aligned with the progressive, left-leaning nature of the Mission District neighborhood. That day the message was: Black Lives Matter. And as an African American, I had to concur. Only a couple of weeks earlier, the nation had been confronted with a video showing the killing of an unarmed African American male who was shot in the back by a police officer in South Carolina, just the latest in the string of incidents that have given rise to the Black Lives Matter movement. – Why should Black lives matter? I mean, of course they do, but why more than anyone else’s? – I think all lives matter. – Yeah, that’s what I would have said. I discreetly turned around, pretending to look at the various baked goods on display beside me, but really seeking to find out just who could have been so oblivious to the context behind a phrase that has become its own Twitter hashtag: #BlackLivesMatter. Behind me stood two young men, both White, in their late 20’s or early 30’s and dressed in hipster fashion (although only one sported the requisite amount of facial hair). In other words, these were exactly the sort of people one might expect to find standing in line for pricy pastries on a sunny afternoon in the Mission. Oscar Grant. Trayvon Martin. Tamir Rice. Eric Garner. Walter Scott. While you may not recognize all of these names (and there are others I could add to the list), chances are at least one will cause you to pause and remember a headline, a video clip, a scene from a protest march in Oakland or elsewhere. But that day at the bakery, I knew that those names resonate with me for reasons that I feel intensely. Yet I couldn’t find the words to articulate my frustration to those two young men who had the luxury of insisting that all lives matter equally. Instead I left the store, wondering what could I say the next time I found myself in a similar situation? As it happens, I got my answer the next day, courtesy of the New York Times. On April 20 the Times ran a story about a demographic study showing that among African Americans between 25 and 54, there are only 83 black men for every 100 black women. (For whites, by contrast, the ratio is 99:100 – in other words, near parity.) The “missing black men” are either in jail or in the grave, their early deaths often due to preventable disease or gun violence. Add the numbers up, and 1.5 million men in my age cohort and racial category – a number equivalent to the entire population of Alameda County – have simply “gone missing.” These men were sons, fathers, and brothers. For the men, women, and children who loved them, no doubt their #BlackLivesMattered, until they were taken away from them. As the Times commented in a subsequent editorial on April 25, this gender imbalance reveals itself in “lower marriage rates, more out-of-wedlock births, a greater risk of poverty…and by extension, less stable communities.” The surge in Black male imprisonment following the never-ending War on Drugs not only contributes the missing man problem, it has “stigmatized blackness itself.” And as Black men and those who love them have learned, that stigma yields consequences ranging from subtle discrimination in their day-to-day lives to death at the hands of the police. Removing that stigma requires all of us, regardless of color, to confront our own internal racial biases as well as the structural racism that, at its worst, literally costs lives. But until we do, the burden of the stigma will continue to be felt most acutely by African Americans, who collectively remain vulnerable to the evils of racism regardless of any progress we make as individuals. And that, quite frankly, is why we must be reminded that Black Lives Matter. 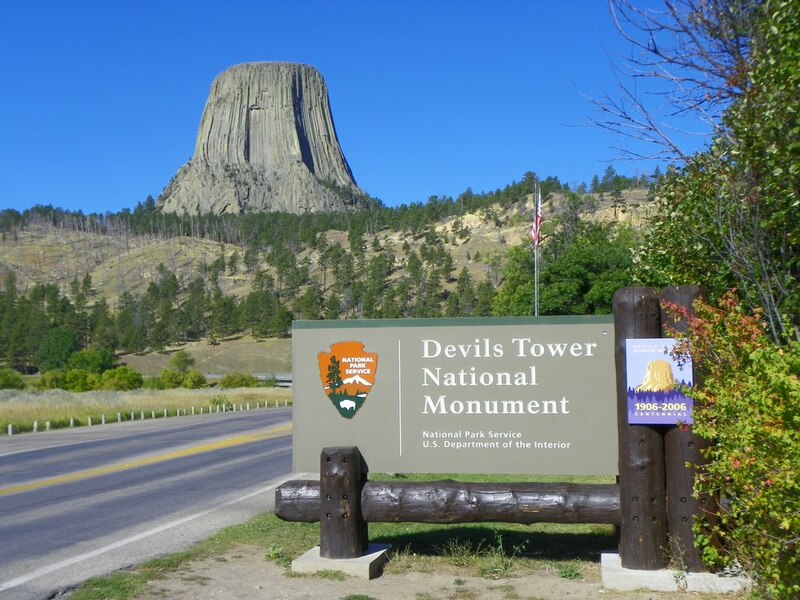 Devil’s Tower National Monument is a strange aberration, rising almost 1300 feet above the surrounding prairie. It’s a sacred place for several native cultures, but, outside of tourist season, prairie dogs and pronghorn antelope are more common than people in this windy and open landscape. What’s it like on top? As natural as these questions are, they reveal a misunderstanding of the difference between rock climbing and mountaineering. Mountaineers, or alpinists, sometimes climb rocks and rock climbers sometimes climb mountains, but the activities are very different. The primary goal of mountaineering is to get to the top of a peak or other feature and rock climbing started because sometimes mountaineers need to do it as they make their ascent. Mountaineers began to practice climbing on relatively short cliffs and sometime in the mid-20th century, rock climbing began to be something people did as an activity unto itself. Unlike mountaineering, getting to the top is almost never the point for a rock climber, because there are almost always others ways of getting to the top. Sometimes it’s as simple as walking up the backside of a cliff on an easy trail. Sometimes you actually start at the top of a cliff and lower yourself down to the bottom so you can climb back up. With Devil’s Tower, there’s no easy backside trail, but a rock climber doesn’t go there to get to the top. In fact, when you do get to the top, you enjoy the view for a few minutes, but usually for far less time than it took to get there. 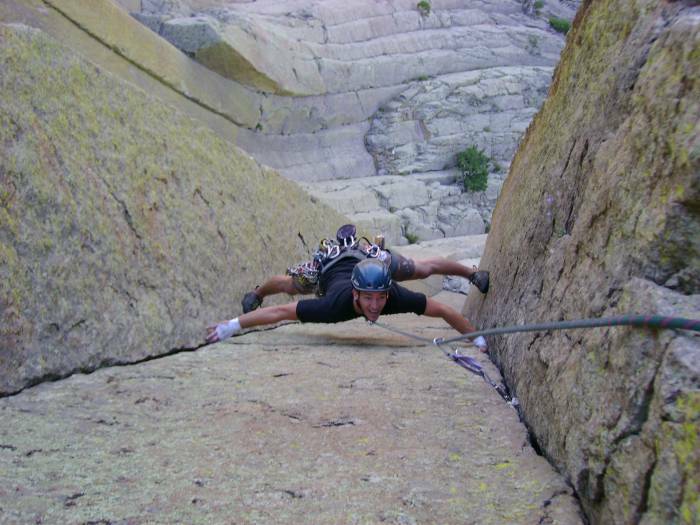 Instead, you go to Devil’s tower for the unique quality and size of the routes. Climbers like rock in ways that other people don’t. They speak of rock features in an entire specialized language – arêtes, dihedrals, faces, cracks, and specialized subcategories of each. Rock can be slick or friable; cracks incipient; handholds and footholds solid; routes have cruxes. Geometry and shapes are seen on rock walls, like glacial clouds. 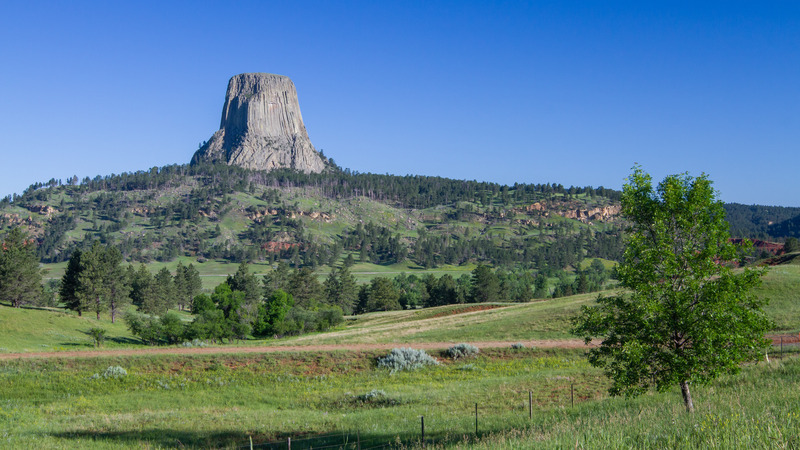 Devil’s Tower rock has cracks, grooves, and straight-sided chimneys that are rare elsewhere. So the point of rock climbing is in the pleasure of seeing and touching rock up close and, more importantly, from moving over it. When all is right in your climbing world, you move fluidly over rock, feeling the exhilaration of a well-functioning body and mind. You feel confident and competent and ready for whatever comes next. When all is right, there is no need for the 200-foot ropes and other gear that climbers use. The gear is there to protect you in case you fall, for those days when the holds feel small and tenuous and your body feels weak and incapable. You hope never to need the gear, but you bring it because you know you’re human and you know that there are bad days – and bad days, too, contain the satisfaction of safely negotiating your vulnerability. 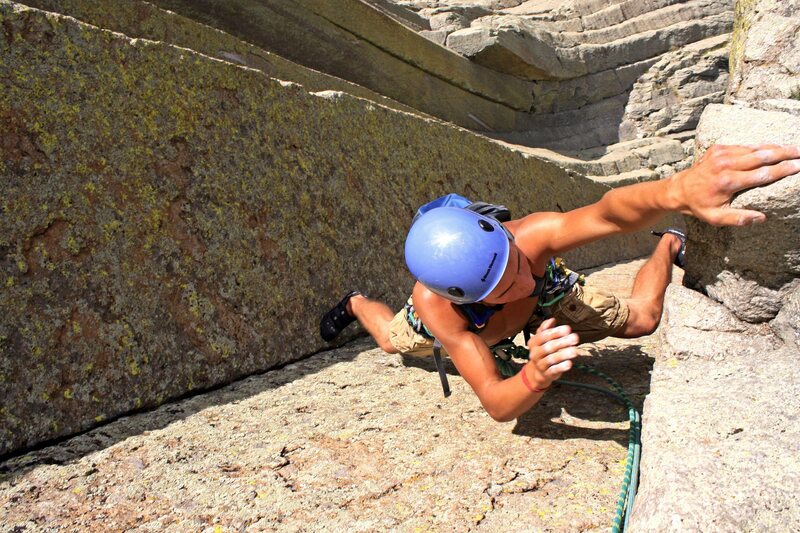 Rock climbing is about deciding how you will get to the top and staying true to your intention. Or if you fail that day, it’s about coming back another day and trying again. It’s as much about about process as product. Getting to the top is nice, but getting to the top with integrity and grace is a transcendent and transformative experience. It’s hard to talk about transcendence and transformation. 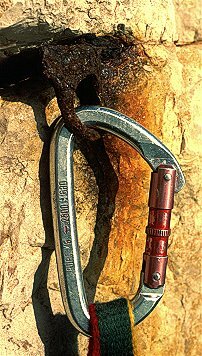 It sounds mystical and a long way from carabiners, pitons, and clinging to nubs of rock as you struggle up parts of a 1300-foot wall. So, when tourists at Devil’s Tower ask their questions, you try to smile and answer with the same integrity and grace with which you attempt to climb. Sometimes you fail. But there’s always tomorrow to try again. 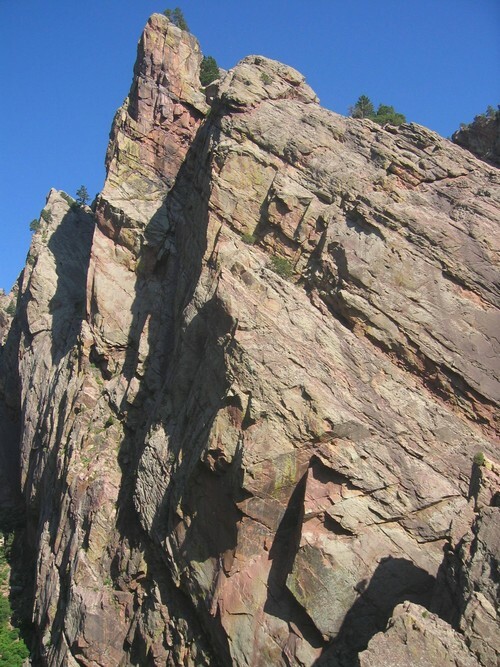 I remember a day in a Colorado canyon, on the side of a 750-foot cliff. I had taken a less experienced climber up a route that would take us a few hours. We were near the top, resting at a belay together before the final stretch of climbing, an exposed section that lead out on semi-rotten rock. 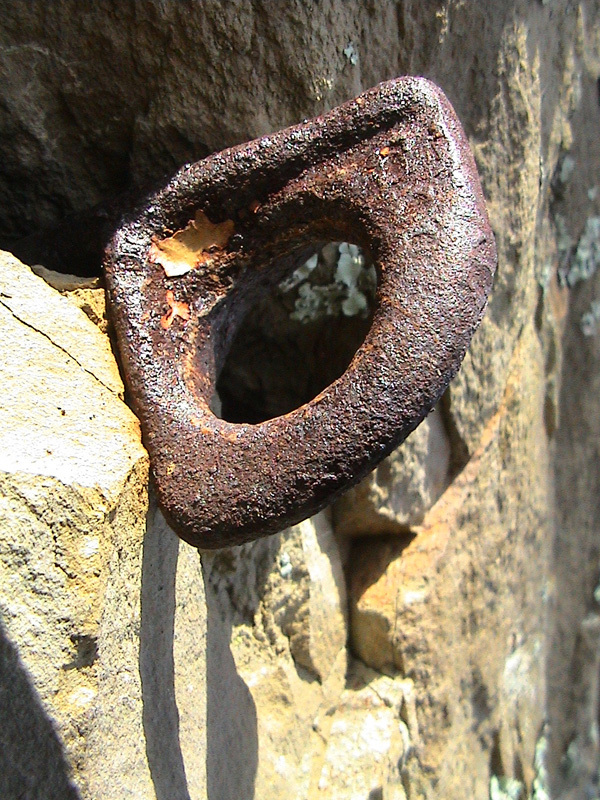 The only protection against falling in this part of the rock wall were small metal nails, called pitons, hammered into the rock what looked like decades earlier. They appeared very old and rusted. There would be a lot of empty air under our heels as we made the moves. We were thirsty and out of water. The view was spectacular, but despite the fact that I had led us to this place, the anticipation of the next part sat very heavy in the pit of my stomach. I asked my friend if he wanted to take the lead on the final section, but he didn’t want it and I didn’t blame him – it was a daunting prospect. I had got us into this and I had to get us out. I sat there considering the options. Retreating from our location would have been at least as risky, if not more so, than going up. Daylight was waning. I had to go on. I checked to make sure my gear was in order and steeled myself to move. The first part was mostly sideways, angling up a little past those ancient pitons. I didn’t look at or think about anything except placing my hands and feet, testing each hold gingerly before fully committing my weight. Everything held and at the end of the traverse, I looked back at my friend, only 20 feet away, but with hundreds of feet beneath us. He was holding my rope and paying full attention to the situation. We were bound together by that thin cord. Our eyes met, but we said nothing and I smiled a little as I headed up over a vertical section of rock to easier ground and, eventually, to the top of the climb. We made it without mishap. For me, climbing is a form of meditation and an art form. It is a practice that requires discipline, focus, and strength, both mental and physical. It is about the objective hazards of putting your body in places that your consciousness says are not okay and dealing with the emotional, psychological, and physical consequences of that choice. It is also about solitude and the wilderness and bonding with a friend. I have been a rock climber for 27 years. At 47 years old, I’ve climbed for more than half my life, putting in thousands of hours and miles of vertical distance. The lessons that I learn are often hard to put into words, but it is part of my life now and I celebrate every opportunity I have to practice. So much of what we do in life is about trying to keep calm in the face of challenges that literally make us sick. We would do anything to avoid painful circumstances that, if we face the truth, we put ourselves in. When climbing, there is no avoiding the situation. You must deal with it or the consequences will be immediate and severe. You must face your fears head on. This does not mean you ignore your fears. As I climbed past those old pitons, I connected my rope, and thus my body, to them. And I was afraid at the same time. That fear was justified, because I had little confidence that they were strong enough to hold me if I had fallen. At times the fear of a particular climb has caused me to avoid it and even to head home early. Who knows what would have happened in those cases, but there is little doubt that the fear is rational and should be headed sometimes. As I like to say, a good day of climbing is a day in which you arrive home safely.